Donovan started his career with the youth set up at Charlton Athletic, but was not retained at the end of his scholarship. He joined Coventry City in July 2007 on a two year deal, but did not make a first team appearance, going out on loan to Gillingham in March 2008 until the end of the season. The following season, Donovan went on a season long loan with Kilmarnock. After his release by Coventry in the summer of 2009, he spent a short period with Maltese side Floriana, before joining Scottish Division 1 side Morton in February 2010. Donovan arrived at Nene Park on 6 August 2010 on a short term contract. He made his Diamonds debut in the 1-1 draw against Fleetwood Town on 14 August 2010 at the start of the Conference season, and made a further substitute appearance before leaving the club after his contract was not renewed at the beginning of September 2010. He signed for Conference North side Nuneaton Town on 17 September, before signing for Conference South side Dover Athletic on 8 December 2010. After 18 months with the Whites, he left at the end of the 2011/2012 season, signing for Conference South rivals Boreham Wood on 1 June 2012. He failed to play in any of their pre-season games, and eventually signed for Conference North side Bishop’s Stortford on 16 August 2012 making two appearances at the start of the season before joining newly promoted Conference side Nuneaton Town on 31 August 2012 on a non-contract basis. 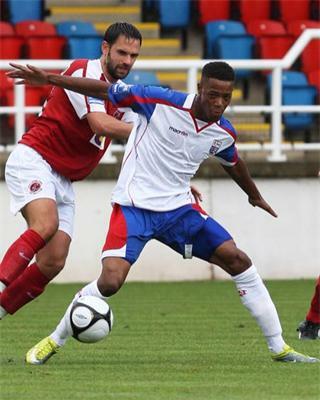 His stay was short lived however, and he signed for Conference South side Chelmsford City on 28 September 2012. Donovan helped the Clarets to the Play-Off Final in May, losing out to Salisbury City, but left at the end of the season. On 9 July 2013, he signed for fellow Conference South side Boreham Wood, but left after some four months, joining Isthmian Division One North side Tilbury on 8 November 2013. He left at the end of the season, and joined Conference North side Tamworth on 2 August 2014. He moved to Bishop’s Stortford two months later, spending the remainder of the season there, before spending the next two seasons with VCD Athletic. He had a brief spell with Kingstonian in 2017 before joining Thamesmead Town.